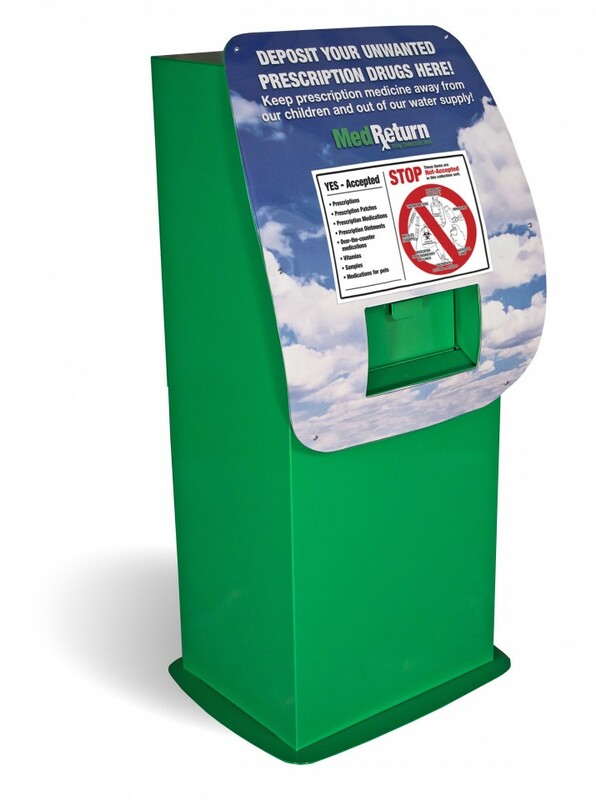 Safe RX Disposal | Protecting homes, health, and the environment. For more information please contact the Youth Community Coalition or the Boone County Sheriff’s Department. Address: 2121 E. County Dr.
Public Health, and Public Safety. 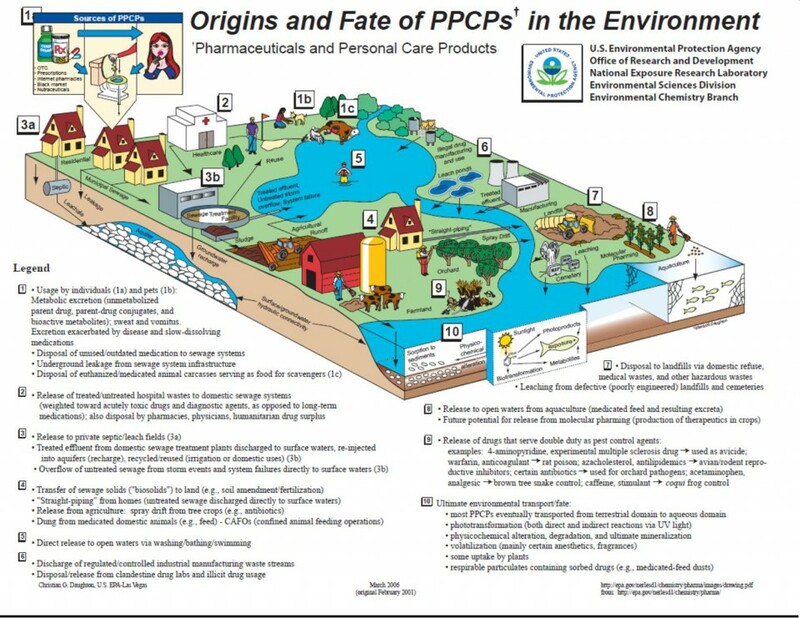 Each year, millions of American’s keep their old prescription medicine in their cabinets or flush them down the toilet without realizing the harmful effects it can have on the environment, public safety, and people’s overall health. 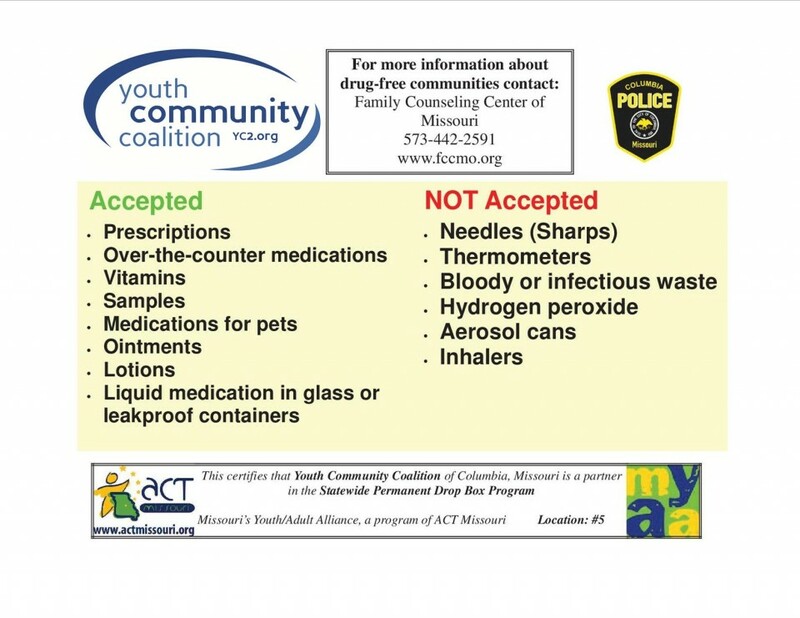 Youth Community Coalition has partnered with the Columbia Police Department to provide a permanent drop box in which community members can safely and anonymously dispose of unwanted, expired, and unused medications. Columbia’s drop box is located at the Columbia Police Department on 600 E. Walnut Street. Please see the guidelines below instructions on what is accepted at the drop box. 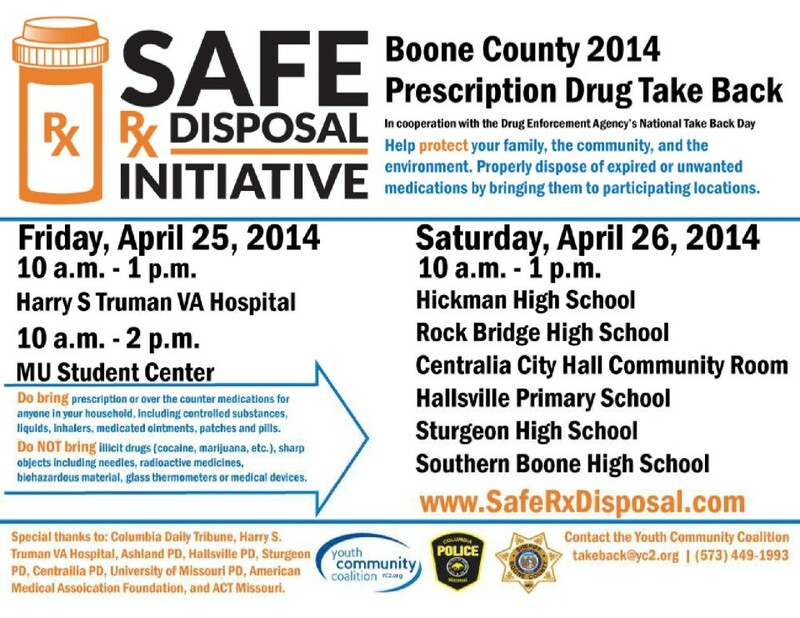 The Youth Community Coalition along with the Boone County Sheriff’s Department and the Ashland, Hallsville, Centralia, and Surgeon police departments will host Prescription Drug Take Back Days periodically throughout the year. At these events, community members can bring any unwanted prescription medicine and the coalition will dispose of it properly. 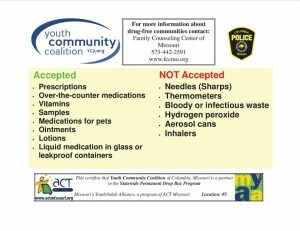 For more information, please call the Youth Community Coalition at 573-449-1993 or email: takeback@yc2.org. Before throwing out a medicine container, such as a pill bottle, remember to scratch out all information on the prescription label to make it unreadable. This video demonstrates how to dispose of pharmaceuticals at home. Check to see if your medication came with any disposal instructions in order to determine if it is safe for disposal by flushing. Improper disposal of prescription medicine pollutes our water supplies, which can affect our wildlife. A recent study shows that 80% of US streams contain small amounts of human medicine, harming our wildlife. In addition, throwing away old medicine can also be harmful. When disposed improperly they can end up in garbage dumps where they are ingested by animals and scavengers. In addition, flushing medications down the toilet can also negatively impact Americans’ health. According to an Associated Press investigation, small traces of medicines have been found in drinking water supplies of at least 41 million Americans. 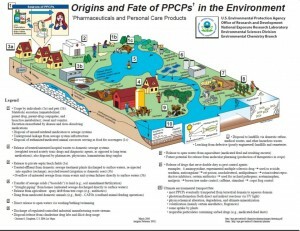 The following graphic shows how pharmaceuticals make their way into different parts of our environment. Keeping old prescription drugs in medicine cabinets can also be harmful to public safety. During home invasions, perpetrators can raid cabinets in order to find any leftover prescription drugs. If found they have the potential to ingest them or potentially circulate them around the community, which can comprise public safety. Keeping unwanted or unused prescription drugs in the medicine cabinet can also be harmful to one’s health. According to the 2012 Monitoring the Future survey of U.S. teen substance use, prescription and over-the-counter medications were among the top substances abused by 12th graders in the past year. In 2011, about 1.7 million people 12-25 years old, or more than 4,500 young people per day, abused a prescription drug for the first time, according to the latest National Survey on Drug Use and Health. 70 percent of teens who abuse prescription drugs say they get them from family members and friends. This is why properly managing and disposing of medications is so important.